Born on September 8, 1942, to Lowell and Florence Hargan in Fort Wayne, Indiana, Steven Lowell Hargan was raised with sports – baseball, football, and basketball – in the hoops-crazed state. His parents were avid golfers; as a city employee, his father was a weekend player, while his mother played on a team sponsored by her employer, General Electric. Steve’s first contact with organized baseball occurred when he tried out for and made a Little League team as a 9-year old in the summer of 1952. He played first base and third base and caught. Hargan recalled that he did not start to pitch until he “grew up,” but by the time he was in high school it was clear that he would be a pitcher. He progressed through the city league system, from Little League and Pony League to the Junior Federation and Connie Mack League. A stellar all-around athlete, he excelled at football and basketball at South Side High School, where he graduated in 1961, but his school, like many in Fort Wayne, did not have an organized baseball team. Hargan’s progress through the minors to the Indians was methodical, with stops at five different teams and leagues. Several weeks after signing his contract, Hargan reported to the Selma Cloverleafs in the Class D Alabama-Florida League. As an 18-year-old in the Deep South for the first time, it was “culture shock because of segregation,” he said. Hargan pitched in nine games in the second half of the 1961 season, including four starts, and earned four wins in 43 innings, but he was still primarily a one-pitch (fastball) pitcher. “I needed to come up with a breaking ball,” Hargan said. “. . . (In 1962) I was sent to Dubuque, Iowa (Class D Midwest League), and that’s where Hal Newhouser, the pitching coach there, showed me how to hold a slider. That’s what really got me going up the ladder through the minor leagues and into the major leagues.” Learning the slider, Hargan won eight games and lost seven with a 3.43 ERA, and in midseason was promoted to the Burlington Indians in the Class B Carolina League. With stiffer competition, he struggled, notching just one win and losing four games and his ERA shot up to 6.69. On August 3, 1965, Hargan made his first major-league start, at home against the Detroit Tigers. He said his debut “was quite exciting. I remember I started against Mickey Lolich and he was already an established pitcher. I was trying too hard and throwing as hard as I could.” He cruised through the first three innings and led 4-0, but then he gave up two runs in the fourth inning, and was lifted after giving up a run in the fifth (two baserunners he left also scored) without retiring a batter. He got a no-decision as the Indians lost 12-7. In front of friends and family, he got his first major-league win, against the California Angels on August 25 at Dodger Stadium, in the Angels last season there. After six starts he had a 2-2 record and sub-4.00 ERA, and Indians manager Birdie Tebbetts said that he had not yet pitched a bad game; however, Hargan was rocked in his seventh start, lasting just two-thirds of an inning, and then was relegated to the bullpen for the remainder of the season, except for one start. Nonetheless, Hargan impressed Tebbetts with his fastball, slider, and occasional curveball, and finished with a 4-3 record and 3.43 ERA. For the third consecutive winter he played winter ball, with Valencia in the Venezuelan League, where he had a 9-5 record and 1.91 ERA in 150 innings while leading his team to the playoffs, which they lost to La Guaira. Hargan arrived at the Indians’ spring-training facility in 1966 with the confidence that he’d play a major role in the team’s pitching fortunes. Pitching coach Early Wynn commented: “Hargan has all the tools of a good relief pitcher – a good slider, good curve, and good control,” yet Hargan wanted to start. After Hargan’s strong spring, manager Tebbetts remarked, “Hargan has shown me a much better curve this spring and he stills has an outstanding slider and a good fastball. I frankly don’t have any idea where this kid will be used.” He pitched out of the bullpen for the first two months of the season, including his 10-inning win against the Angels; however, it was clear that the Indians needed him in their starting rotation. He made his first start on June 22, defeating Boston, and two starts later received national attention after he pitched his first career shutout, a seven-hitter against the Minnesota Twins in Minneapolis, on June 30. It was discovered that two days before pitching the shutout he had gone with a friend to a hypnotist in Minneapolis in order to quit smoking. After the shutout he missed his next two starts because of infected tonsils. Hargan arrived at spring training in 1967 rested, after not playing winter-league ball for the first time in four years. He, McDowell, and Tiant were being touted as possible 20-game winners. He started the season strong and pitched shutouts in his first two starts in April. By midseason his 9-7 record with a 2.68 ERA and 10 complete games in 17 starts earned him a berth on his first and only All-Star team. He pulled a hamstring in his last start before the All-Star Game and did not pitch. He missed two starts; in his second start back he pitched one of his best games of his career, an eight-hit 12-inning shutout against the reigning World Series champion Orioles. A month later he pitched an 11-inning complete game loss. It was the fourth time he had pitched at least ten innings in the last two years. First-year manager Joe Adcock called Hargan “a complete professional,” and Orioles third baseman Brooks Robinson rated Hargan and Jim Lonborg of the Boston Red Sox as the two best pitchers in the American League. Sportswriter George Vass said, “He’s a great thinker . . . about pitching. . . . He pitches quick (about eight seconds between launchings) and throws strikes and makes everyone more alert.” Though Hargan was shut down two weeks before the end of the season because of tendinitis in his pitching arm, he still led the American League with six shutouts and ranked second in complete games with 15 and seventh in ERA (2.62) while winning 14 games on a team that finished 12 games under .500. Hargan began the 1968 season where he left off the year before. In his third start he pitched a one-hit shutout over the Tigers in Cleveland. Two starts later, he tossed a three-hit shutout against the Twins. His success led pitching coach Jack Sanford to remark, “Hargan reminds me of Robin Roberts”; however, Hargan’s arm was in pain and he needed regular cortisone shots to stay in the rotation and calm the inflammation in his right elbow. By the end of June he was no longer effective as a starter and had trouble pitching more than three innings. He was relegated to the bullpen and pitched only once after September 1. He finished the season with an 8-15 record and a 4.15 ERA. “I had tendinitis real bad in my right elbow and that is what was giving me so much pain,” Hargan told the author. “I was getting cortisone shots every week so I could pitch. And then I developed a bone chip which was resting on my ulnar nerve. I started developing sleepy feelings in my [last] two fingers. I kept regripping the ball; I couldn’t feel the ball.” Eventually Hargan underwent surgery to fix the ulnar nerve. In 1970, hoping that his arm problems were behind him and that he could overcome his pitching woes of the previous two seasons (a combined 13-29 record), Hargan had an encouraging spring with no arm pain, but he nonetheless began the season as a reliever. However, he had only four appearances and 7 2/3 innings pitched in the first three weeks of the season, then was pummeled in his first two starts, not making it past the fifth inning. Arm trouble had come back and he was put on the disabled list. The Indians wanted to option Hargan to the Triple-A Wichita Aeros and placed him on waivers. No team had any interest in acquiring him, and he remarked, “I am certainly not happy about it.” Aeros manager Ken Aspromonte put Hargan to work pitching regularly, and “things started coming together.” Dark and general manager Paul went to see him pitch. “I didn’t have a stellar game, but I pitched well enough. They brought me back up and everything fell into place,” Hargan said. He was recalled on July 16 and on July 18 pitched a two-hit complete-game victory over Kansas City, winning 4-1. Over the next 2½ months Hargan pitched the best he had in his career, and was one of the most successful pitchers in all of baseball: he was 10-1 with eight complete games. Indians catcher Duke Sims said, “I think Steve is throwing better now than he ever did. I’ve seen him throw harder, but not better.” Even Hargan noticed a difference from the previous 2½ years: “My control is better . . . and my slider is back, too. It has become my best pitch again.” After the season he said, “I guess I learned to pitch. I tried to make good pitches with all four of my pitches [fastball, slider, curve, and change-up]. 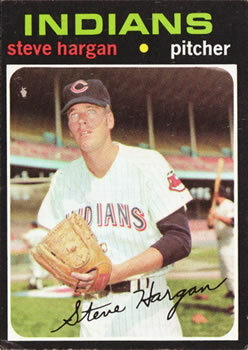 Hargan’s success in second half of 1970 earned him the chance to be the Tribe’s Opening Day starter in 1971. He lost to Detroit, 8-2, going only two innings. Hargan, though, was just relieved to be pitching well again: “I’m just happy to be a starter, considering all of the trouble I have been in the past.” However, he was ineffective in his first seven starts. He was 0-5 when he suffered a hairline fracture of his right ankle in a play at first base on May 4 and was out for six weeks. He won his first start after a stint on the disabled list, but soon lost his effectiveness and was relegated to mop-up duty in the bullpen by manager Johnny Lipon. Explaining his pitching woes, Hargan said his arm felt fine, but his ankle limited him: “I could not drive off the mound. I couldn’t get my pitches in the right location. Then it becomes a mental thing and you’re afraid to make bad pitches.” He ended the season with a 1-13 record and a 6.19 ERA. In 1972 and 1973 Hargan was at a crossroads in his career. Ever optimistic and desiring to contribute (“I want to remember and learn from what happened to me last year”), Hargan began the 1972 lost in the Indians’ bullpen. After just eight appearances in the first three months of the season, Hargan was optioned to the Portland Beavers in the PCL and cleared waivers again. He was frustrated, disappointed and angry. “To tell the truth, I don’t want to come back to this organization,” he said. “I would rather go to another organization and start all over.” In Portland he started 11 games, winning four and losing seven. He was called up in September, made four relief appearances, and his major-league record was 0-3 with a 5.85 ERA. On November 20, 1972, the Indians assigned him outright to their Triple-A team in the American Association, the Oklahoma 89ers. He struggled for most of the season and was used primarily as a reliever. With a 7-8 record and 5.13 ERA in 114 innings at Oklahoma, the 30-year-old Hargan thought his career might be over. Despite his lackluster performance and pitching in the minors for the entire 1973 season, Hargan had a stroke of luck by playing for manager Frank Lucchesi: “You’ve got to have somebody who likes you. Frank Lucchesi went with Billy Martin that winter to the Texas Rangers. He put in a good word for me. They called me up and wanted to know if I wanted to go to the Rangers for a look-see.” The Rangers liked what they saw, and in December got him in a trade. Hargan spent three years with the Rangers (1974-1976), was a dependable starter, and surprised many by making it back to the majors considering his nightmare of the last three years. Hargan noted: “It gave me a new lease on life and career. I loved playing down there [in Texas]. It was a nice organization.” He was an early camp sensation and Martin anticipated using him in relief, but after two effective outings he was put in the starting rotation and pitched well the entire season for the surprise team in the American League in 1974. His 12-9 record and 3.95 ERA had him in the running for the American League Comeback Player of the Year award. He said he respected Billy Martin and had confidence in him: “He’d make you try to pitch out of trouble at times. You start a game and he’d give you an opportunity to win the ballgame. As a pitcher you appreciate that.” To start the 1975 season, Martin toyed with the idea of a six-man pitching rotation to help Hargan, (“Hargan . . . seems to work better with extra rest.”), but later scrapped the idea. In fact, Hargan may have been more effective in 1975 than in 1974 despite his 9-10 record; he had a 3.80 ERA. On June 23 in Anaheim he pitched one of the majors’ best games of the season: 11 1/3 innings of shutout ball against the Angels in a 13-inning, 1-0 victory for the Rangers. In 1976 the 33-year-old Hargan was used primarily out of the bullpen with occasional spot starts, including a 12-inning complete-game 3-2 victory over the New York Yankees in which he struck out 10. Hargan finished with an 8-8 record and lowered his ERA to 3.62. The 1977 season was Hargan’s last in the major leagues, and no doubt it was his strangest. It all started on November 5, 1976, when the Toronto Blue Jays took him from the Rangers in the expansion draft. Hargan recalled that he was shocked: “I did not know that I was available until I got a call from a sportswriter in Toronto [who told me] that I was chosen. I was shocked that I was drafted because I wasn’t expecting it. I enjoyed pitching for the Rangers so much; I was disappointed. And then I thought, at least I am still in the big leagues.” At 34 he was the oldest pitcher on the Blue Jays’ roster. He got his first victory in relief in the fourth game of the season and then entered the starting rotation. Then, after his best performance of the season (a complete-game loss), on May 9 he was traded back to the Rangers, for whom he pitched six times in relief. Then on June 15 he was traded to the Atlanta Braves. He pitched with three teams in just under six weeks. But he had lost his control and thus his effectiveness. He limped to a 2-6 record and 6.55 ERA. Hargan said he had carpal tunnel problems in his right wrist that were diagnosed incorrectly. “They thought it was just tendinitis so they’d give me cortisone but that was not the problem. I started regripping the ball and I didn’t have the right pressure points. I started struggling again, but my arm felt good.” Atlanta released him on December 13, 1977. Hargan attempted to land another home in 1978, but was still bothered by the carpal tunnel problem. “By the time I had it operated on, I was going to spring training.” In March the Minnesota Twins invited him as a nonroster player to their Toledo farm team with the understanding that he could become the tenth pitcher on the parent club if they needed one. But after five appearances with the Mud Hens he was released. He found new life by signing with the Pittsburgh Pirates’ farm team at Triple-A Columbus, managed by Hargan’s longtime mentor, Johnny Lipon. Lipon helped him develop a forkball and he had some success. He pitched 170 innings as a starter and had a 9-12 record. The Pirates wanted him to pitch at Mexico City in the winter league to work on his forkball, but the 35-year-old Hargan had different plans. “. . . I thought, ‘It’s time. I’ve had my career.’ ” After pitching for 14 teams from 1961 to 1978, Hargan retired. His major-league record was 87-107 with a 3.92 ERA; he won 70 games in the minor leagues. The author would like to express his gratitude to Steve Hargan, who was interviewed for this biography on September 13, 2011. Unless otherwise noted, all quotations from Hargan are from the author’s recorded interview. In 1966 Hargan received the first award given by the American Amateur Baseball Congress recognizing a successful major leaguer who advanced through their leagues. See Lincoln Hackim, “American Amateur Baseball,” Baseball Digest 28.6 (1969), 60. Hargan has been recognized as one of Northwest Indiana’s best athletes: The Fort Wayne Journal Gazette listed him as the 18th best athlete in the area’s history. (http://www.journalgazette.net/apps/pbcs.dll/article?AID=/20090809/SPORTS/308099904) and the Fort Wayne News-Sentinel listed him as the 23rd best athlete of the 20th century in Northwest Indiana (http://fwnextweb1.fortwayne.com/ns/sports/top50/). The Sporting News, October 17, 1964, 36. For an insightful history of winter-league ball in Puerto Rico, see Thomas E.Van Hyning’s Puerto Rico’s Winter League: A History of Major League Baseball’s Launching Pad. (Jefferson, North Carolina: McFarland, 1995). George Vass. “Horlen, Hargan, Sparma, Veale, LeMaster. Heads Win for Star Tossers.” Baseball Digest 26.7 (August 1967), 9. For an excellent history of the Rangers at this time, see Mike Shropshire’s Seasons in Hell with Billy Martin, Whitey Herzog and the “Worst Baseball Team in History”: The Texas Rangers. (Lincoln, Nebraska: University of Nebraska Press, 1996).